The wonder of urban life is the multitude of possibilities it offers. Jane Jacobs understood that as well as anyone ever has. Among many other things, her immensely influential book “The Death and Life of Great American Cities” (1962) celebrates that aspect of urban living. It’s most famous as an attack on the kind of urban planning that sought to shrink those possibilities, turning cities into antiseptic monuments to tower blocks and highways. 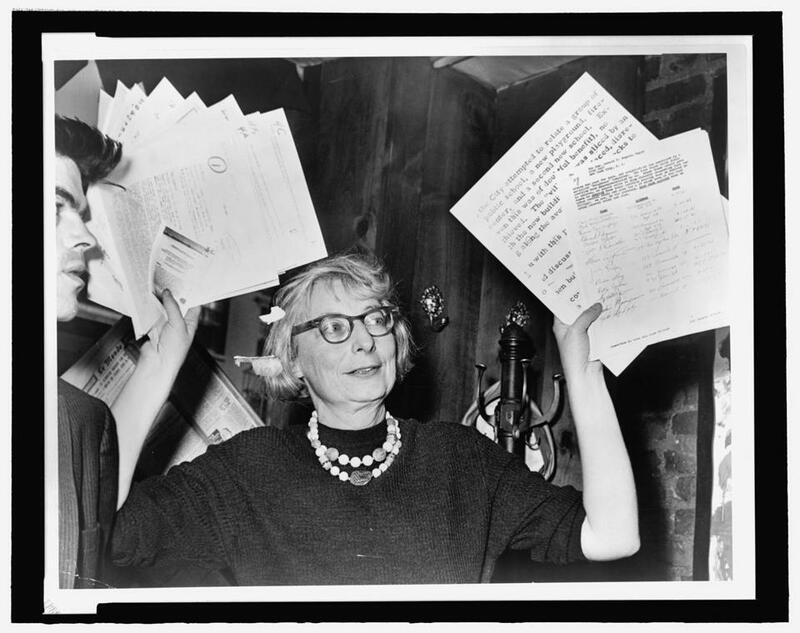 The chief problem with Matt Tyrnauer’s documentary “Citizen Jane: Battle for the City” is its inability to narrow its own multitude of possibilities. Another problem is that title — “Citizen Jane”/“Citizen Kane,” get it? — but that’s a minor offense. Is the film a biography of Jacobs? Sort of. An examination of her ideas? Up to a point. (There’s nothing about any of her later books.) The story of her clashes with New York building czar Robert Moses? In large part. A dismissal of prewar Modernism’s vision of the city and the postwar urban renewal it inspired? That, too. A pondering of global urbanization in the 21st century? A little bit. What “Citizen Jane” is throughout is a talking-heads fest. Among many others, we hear from Jacobs’s editor, Jason Epstein; architect Robert A.M. Stern; architecture critic Paul Goldberger; author Anthony Flint, whose “Wrestling With Moses” recounts Jacobs’s battles with the master builder; various Jacobs friends; and even the late Ed Koch. Before he entered politics and became mayor of New York, Koch was a Jacobs ally in successfully defending Greenwich Village from Moses’s depredations. Jacobs died in 2006. She appears, too, though not often enough: via archival films, TV interviews, news photos, passages from her writing read by Marisa Tomei. Vincent D’Onofrio reads Moses’s words, though it’s hard to outdo the clipped honk of the man’s actual voice. “Today our greatest single problem is tenant removal,” we hear him say at one point. Moses built highways, parks, bridges — and a noose to hang himself with. “I just loved coming to New York,” said Jacobs, who grew up in Scranton, Pa. “It was inexhaustible, just to wander the streets and wonder at it.” Out of that wandering and wondering — out of that observing — came her urban insights. Vigorously practical, she had a profound distrust of theory. That’s why so many of her ideas now seem like simple common sense. Short blocks are safer, more inviting blocks. Mixed use is better use. The more activity there is the healthier a city is. Concentrations of people are what make cities, not concentrations of buildings. Cities are inherently messy; trying to tidy them too much is a recipe for destruction. “There’s a prudishness, a fear of life,” Jacobs said of urban planning. You know what she meant, even if that is a bit harsh. Maybe the biggest problem with “Citizen Jane” is not hearing any pushing back against Jacobs’s views. No one has done so much for our understanding of cities as she did, but that understanding hasn’t remained static over the past half century. So much of the glory of cities is their being all about change. That’s true of ideas about cities, too. Jane Jacobs looked like everybody’s grandmother. She even wrote a children’s book, though you don’t learn that from “Citizen Jane.” She was also one tough cookie who appreciated a good fight. A bit more internal tussle would have both better honored her spirit and made for a better documentary. Directed by: Matt Tyrnauer. At Coolidge Corner. 92 minutes. Unrated (as PG, scenes of government-imposed urban destruction).